My Mother and I were sitting around looking at old photos, which is always a source of amusement, wistfulness, and horror, simultaneously. 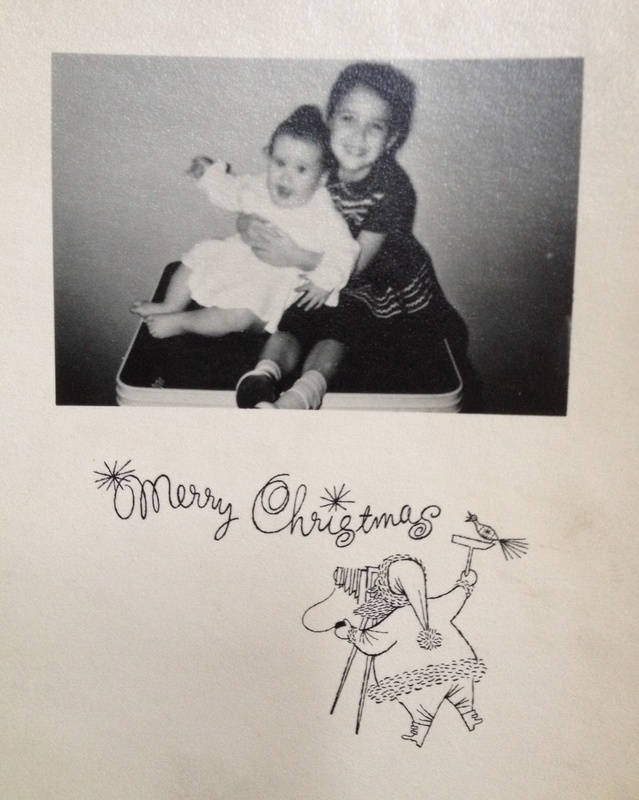 I have pulled out the Christmas ones that have held up the best to share with you, since I sincerely believe that the best humor is self-deprecating, and these all tell a whole lot about who I am today. I hope that they (and that cup of “Christmas Cheer” that you’re enjoying) bring your own fond memories of Christmas past to this Christmas present. My Mother says that my dad always carried this dog-eared photo of my first Christmas in his wallet, even after I was married and gone. I remember nothing about it, except that I still have the Teddy bear stored away. Check out those metal icicles on the tree behind me. Every year, My Mother personally hung each one, strand by strand, because she didn’t trust anyone else to hang them properly. I must admit, I’ve never seen anything come as close to the dazzling effect that she created. Several things come to mind when I think of my first visit to Santa. First, this was taken at the flagship store of the J.L. Hudson Co., in downtown Detroit, the only place that had the Real Santa waiting to listen to your wish list — well, I think there may have been about 10 of them, carefully hidden throughout an elaborate display of animated dolls, toys, and figures. 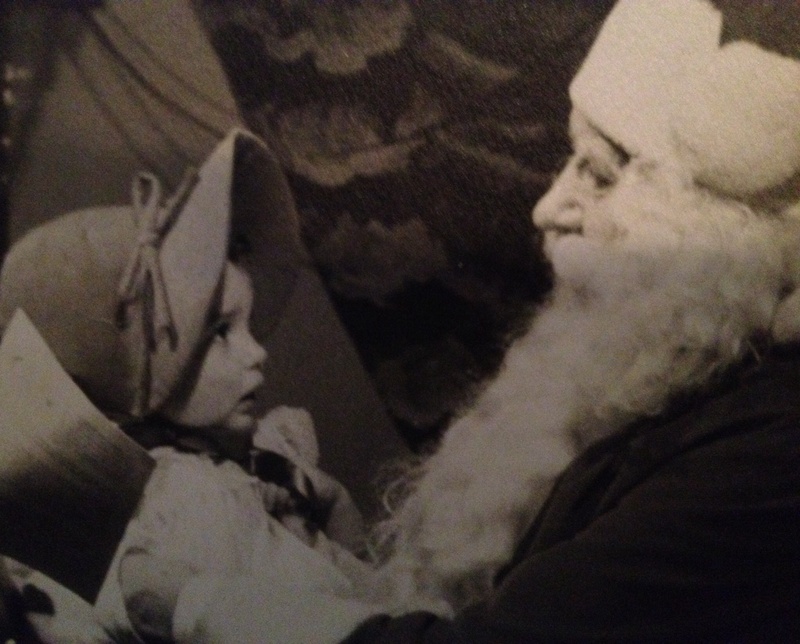 Second, it is apparent from the intense look that I am giving Santa that I learned at an early age to control stage-fright. 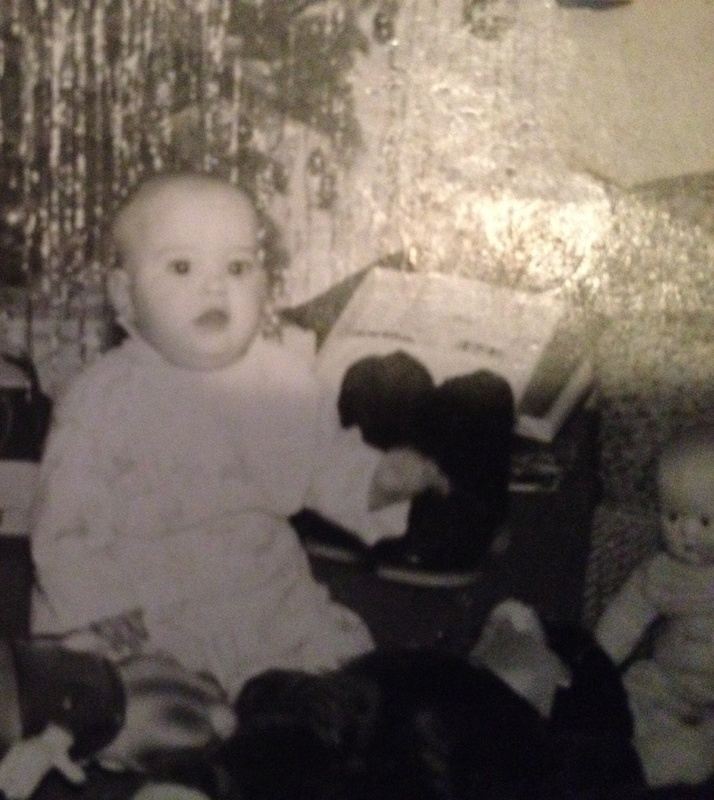 Third, I see that the jowls I had in 1953 have made a return appearance 61 years later. As we looked at the photos, My Mother remarked, ruefully, “Homemade dresses. You girls always had to wear homemade dresses.” I reassured her that I thought it was pretty awesome that I had a new outfit for every major occasion and holiday, AND I designed it. 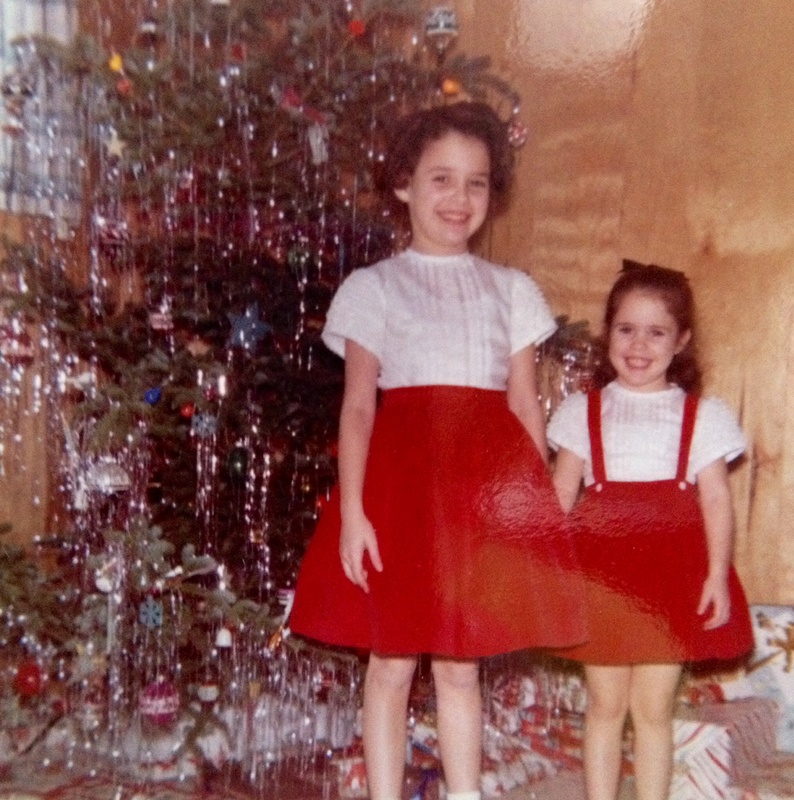 Nothing shameful about these pretty red cotton velveteen outfits from Christmas 1961, and, yes, My Mother sewed all those rows of lace onto the blouses. That’s what the mothers that I knew used to do, and I am ever so grateful that she taught me to sew, too. Now, we move into the snarky teenaged years. This is probably 1965. 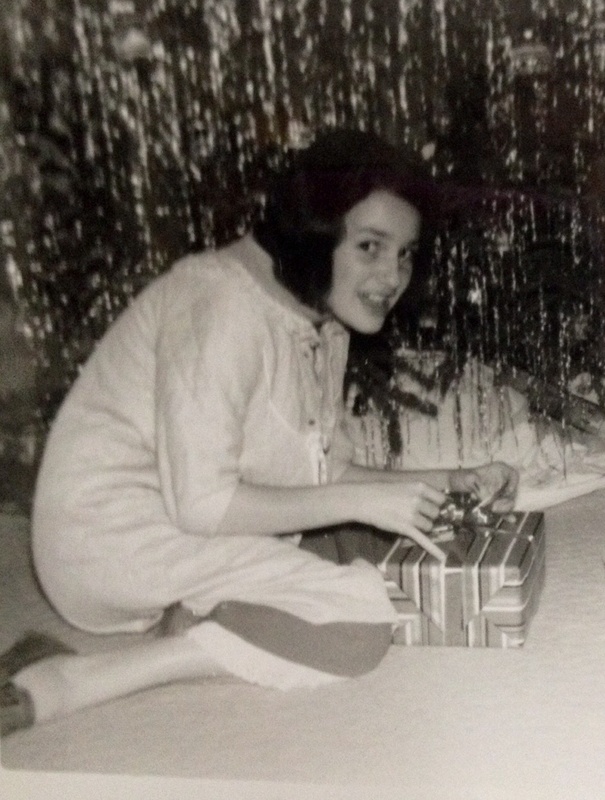 50 years later, I am still appalled that my naturally brunette hair is not flipping crisply on the ends like Marlo Thomas’, but that’s a subject for another blog (“How I survived an Adolescence in the 1960s of Really Bad, No Good Curly Hair”). 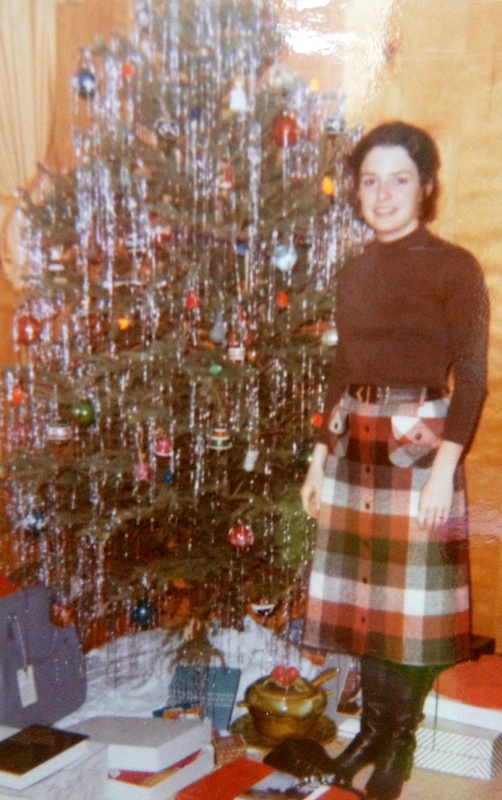 It seems that there are no Christmas photos of me post-marriage in 1972. Actually, I found one from 1984 that’s too dark and mostly out-of-focus that you would find hilarious. I am glamorous in a Joan Collins-style bouffant coif, pink angora sweater with HUGE shoulder pads, ivory wool slacks, and ivory suede boots. It’s such a shame that I can’t reproduce it for your entertainment. Paint this picture in your mind’s eye and run with it: “Dallas” meets “Dynasty” at a party hosted by Dolly Parton. If you graduated from high school anytime before 1990, you’ll get it, and I’m gonna guess you have a similar photo lurking in a shoe box in the back of your closet, too. Finally, here’s the most recent photo of me taken at Christmas, and it is easily my favorite. Trying to recreate the Christmas memories of our youth, when everything was bigger, shinier, and more fun, the Veterinarian and I visited NYC at the holidays almost every year. We gazed at the glittering displays in the department store windows, ate roasted chestnuts on the street corner, and skated at Rockefeller Center. 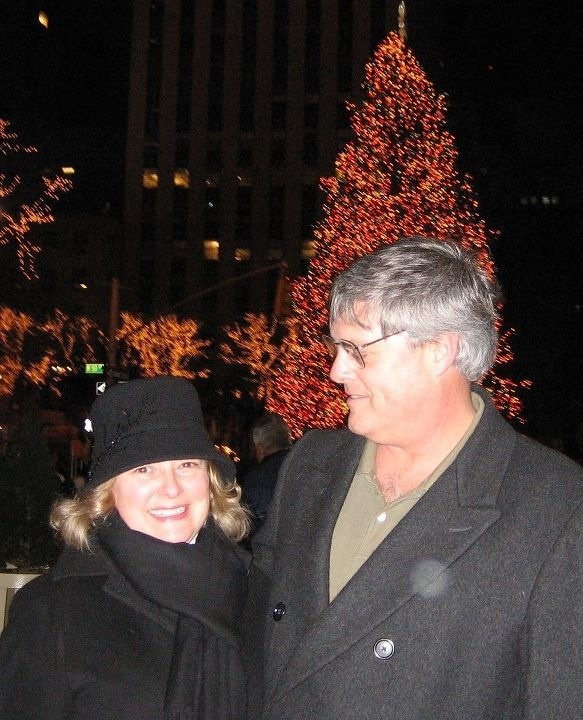 Here we are in front of its famous tree in a photo taken by The Daughter. Do you recognize me now with the blonde hair? Yes, Scrooge, Christmas present is very much like Christmas past. May your days be merry and bright! Categories: Christmas, Mothers & Daughters, Now & Then, Uncategorized | Tags: Christmas | Permalink.